At every opportunity, a grower asks themselves how to save money while maximizing their yields and profits. 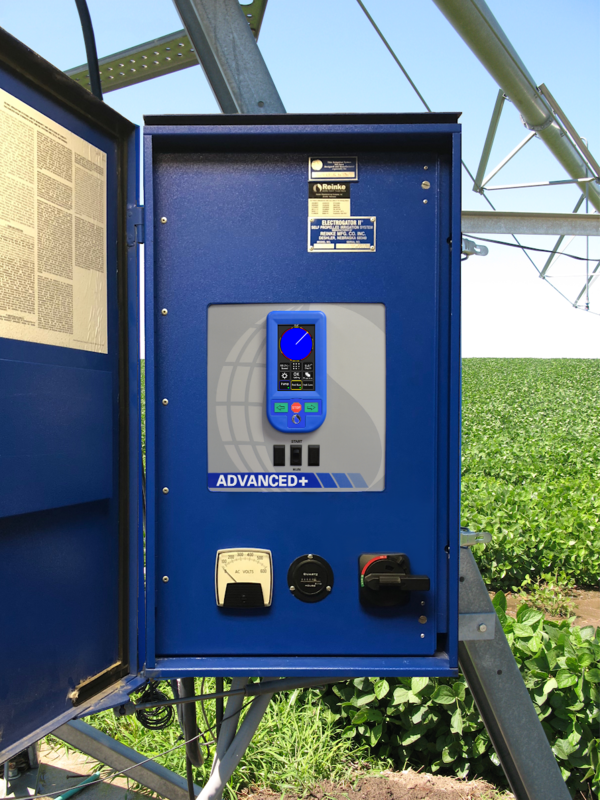 The RPM Advanced Plus™ main control panel can help accomplish this goal by providing additional value that can lead to increased yields, savings and operational growth. Let’s talk about the value of the Advanced Plus™ panel. ​The most noticeable difference with the Advanced Plus panel is the new customizable interface with a 4.3” full color touch screen display. This new display is easy to program and is capable of performing standard functions with the touch buttons such as stop, start, forward and reverse. So, what does a customizable display mean? The grower has the ability to control what they would like to see on their home screen of the display. The display is also easy to program and navigate. The Advanced Plus panel is a ReinCloud-Ready® product. ReinCloud-Ready products are capable of connecting to the remote monitoring and operational software, known as ReinCloud®. ReinCloud gives the user the ability to remotely monitor and control the pivot with any internet connected device. This web-based application is also easy to use and allows the grower to perform numerous functions of the pivot, receive notifications and more. Speaking of more…with the Advanced Plus main control panel there are several additional features beyond the Advanced panel. Electronic flow meter input, independent pump control, pressure restart, temperature restart, speed control by percentage are all standard features of this new panel. Additionally, the grower has additional options such as pressure transducer, record keeping and more. These new features packaged together with ReinCloud offer the grower greater control without having to travel to the pivot. So, we’ve talked about saving labor and fuel by using the Advanced Plus panel & ReinCloud instead of traveling to the pivot, but what about the increased yields and operational growth? Increased yields, savings and operational growth all work together with the Advanced Plus panel. Increased functionality and an easy to use display enables the grower to program the panel with the focus on maximizing watered acres. ReinCloud helps monitor and control the crucial input of water during the growing cycle, which in turn increases yields by applying the proper amount of water throughout the growing season. Combined savings with increased yields is the best recipe for operational growth. Re-invest profits from the operation into additional remote monitoring products, install new Reinke center pivots and laterals on the farm or expand farmable acres. The best part of the RPM Advanced Plus panel is that is comes with a five year warranty. This warranty gives the grower peace of mind and lets them know that Reinke stands behind their product. Advanced Plus panels are available with new systems, as a complete panel replacement or as a faceplate to upgrade an existing RPM panel. Contact your Reinke Certified irrigation dealer for further information and pricing. Want all of your pivots connected under one ReinCloud account? Reinke can accomplish this task with the Annex™ pivot controller. Needing a new panel with full remote operation without unnecessary components? The RPM Connect™ main control panel is a great choice. Both options are built on the Reinke Advanced Plus platform. So, no matter what option the grower wants – Reinke has a product that’ll provide added value for the operation.